bookoutlet2 has no other items for sale. A new volume collecting issues #7-12 of the acclaimed series, with thrilling stories about Tom's island youth, as well as the further adventures of science-fiction heroine Jonni Future and more! 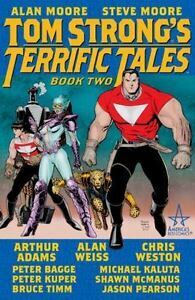 Alan Moore's hero of Millennium City shines in this softcover collecting TOM STRONG'S TERRIFIC TALES #1-6! This volume features thrilling stories about Tom's island youth, as well as the further adventures of science-fiction heroineJonni Future and more! Features stories about Tom's island youth, as well as the further adventures of science-fiction heroine Jonni Future among others. Written by alan moore and STEVE MOORE - Art by ARTHUR ADAMS, ALAN WEISS, CHRIS WESTON, SHAWN MCMANUS, BRUCE TIMM, JASON PEARSON and others - Cover by ARTHUR ADAMS The hero of Millennium City shines in this title collecting TOM STRONG'S TERRIFIC TALES #7-12! This volume features thrilling stories about Tom's island youth, as well as the further adventures of science-fiction heroine Jonni Future and more!